This cake has a bit of a cult following and is a multi award winner. One of the trickier cakes to make… but soooo worth it. The ginger we use is not at all harsh and is delicately balanced with the lemon upper layer. 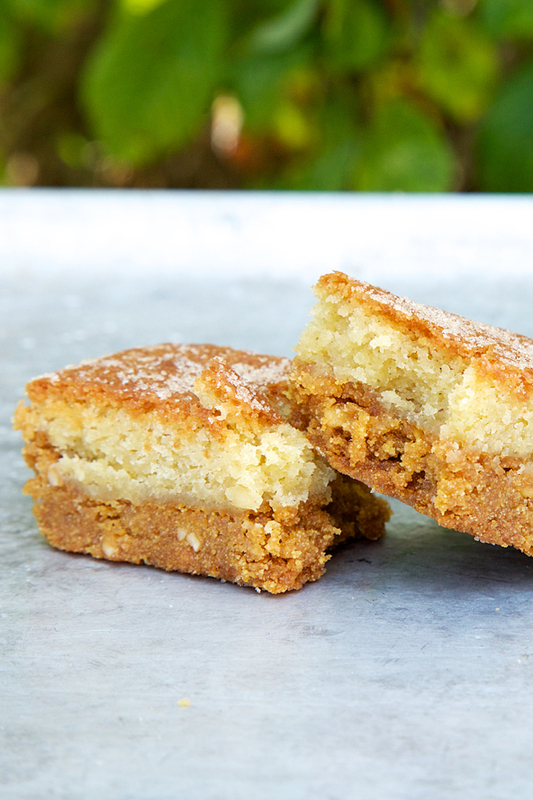 The 'biscuity' base is gently textured with ground almonds and polenta with subtly stem and ground ginger. First we bake the shortbread base before making a lemon frangipane, basically a dense almondy cake mixture, which is spread over the base and it is baked again. This makes a sublime pud in a hurry. Just pop in the microwave or oven; you can serve with our recurring fave, creme fraiche with lemon curd stirred through, or clotted cream ice cream from Purbeck Ice Cream. Fancy baking some of these little beauties? Why not try the Snowy Hills recipe featured in our book 'Honeybuns Gluten free Baking', or this great tip to elevate the Snowy Hills to a quick and delicious pudding. This delicious Lemon & Ginger Shortbread is available to buy in John Lewis The Place to Eat. "Yesterday I tasted the best cake in my life. Truly, thank you, it can be hard trusting gluten free when eating out...Thank you so much for making this little beauty for us to enjoy," P.M.
"Someone just left a Snowy Hills slice on my desk for me this afternoon. It is the best cake I've had in a very long time and felt I had to write and let you know," O.D. "I just wanted to say I had a Snowy Hills and it's one of the most delicious cakes I have ever eaten, even before my gluten free days!" 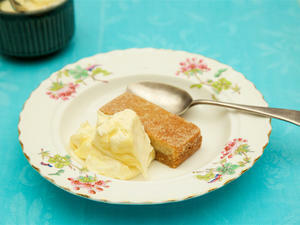 A.M.
"Just had one of your 'Snowy Hills' ginger, polenta and almond shortbread cakes. AMAZING!," R.P. "I have just tried one of your Snowy Hills. I felt I had to let you know it was the nicest thing I've eaten," J. E.